The best way to have wonderful relationships is to do two things: never expect anything from it or from someone and always respect the other person. When we expect someone to be what we want them to be, we are not respecting the person as a special, unique individual. Wherever expectation rises, respect often goes out. Much of the problem in marital or personal relationships is because there is an expectation of faithfulness. While it is important that deceit or cheating must be avoided in any relationship, the nature of the expectation of faithfulness is an indicator that we have stopped respecting the other person. To be faithful cannot mean living someone else’s Life. Or you cannot insist that someone live their Life as you want them to for you to be able to call them faithful. To be faithful means to be true to yourself, first doing what you want to do as long as it will not hurt or harm anyone else. When all people in a relationship are true to themselves, and don’t harm each other, a harmonious environment is born that respects each individual in it. That’s when relationships become meaningful and stand the test of time. This is not to conclude however that love cannot be eternal between people. It can be eternal. 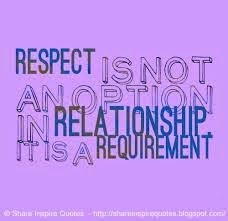 As long as there is respect for the other person and you have no expectations of that person, while being true to yourself first in the relationship.